Teaching my son to wood carve was a great idea, but allowing him to use my tools was not so great a move on my part. After he was interested in it though, I figured I would set out to find him his own set of tools that would allow him to easily manipulate the wood, while also being the perfect beginner’s set, since mine was fairly expensive and more for advanced users. 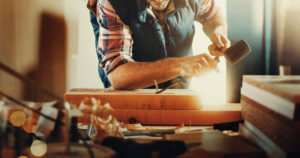 If you’re ever in the same position, or one similar, I figured I would put together a list of some of the best wood carving tools for beginners, so you can find which set works with your child, or even for you. If carving isn’t your thing, you can also check out our review of the best wood burning tools. Wood carving can be fun, and it allows you to create high quality items from just a block of wood, whatever you have laying around. It’s brought me joy, and allowed me to have something to bond with my son over, which is the perfect hobby that we can do together and still have open lines of communication with one another. Comes with multiple tools: Obtaining a whole set of wood carving tools opens up the door to creating many different things, no matter what size chisel head is needed for the project. Carbon steel construction: Carbon steel, as well as other high quality metals can allow the user to have a harder material to work with on the wood, and allows them to choose harder woods, instead of sticking with the softer ones. Quality inspected: The pieces of the set should be quality inspected and checked to ensure that they’re ideal for all types of wood working projects. Quality inspections also ensure that the handle and chisel have a complete, strong hold that will not break down with work. Sharp chisel heads: Pre-sharpened chisel heads are ideal, but if the set comes with a sharpener than this is even better, since they can be sharpened as you work. Affordable price: Price is always a good consideration to make since you’re purchasing them for a beginner in the craft, and you want to get them interested but if they do not stick with it, then you do not want to be out a lot of money either. I was thinking in these terms for children that are learning, and might not carry on the hobby, but all prices can be welcomed depending on your specific case. 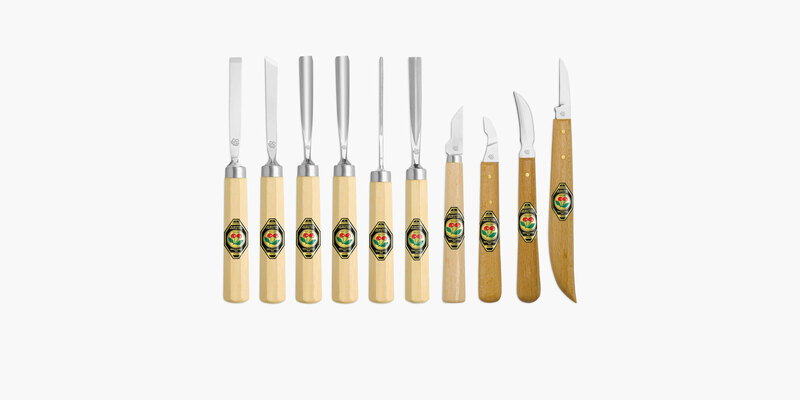 The Carver’s Craft Wood Carving Tools Knife Kit provides the beginner crafter to have an assortment of knives for a variety of projects. It is a smaller kit, safer for children to use and will stay sharp throughout projects that they are working on to ensure that the craft is completed without having the blade fail. The kit comes with 12 different sized and designed pieces for just about any cut, and each is quality inspected for durability. Made from carbon steel, they are strong enough to cut through some of the thickest types of wood material you would find out there, but also provide a safe handle for handling during the cutting process. The set also comes with 26 stencils to use for your first projects, which is ideal when the child is unsure of what they want to start with to begin with, or even adults that are just getting into the craft, as well as directions for use. One of the best things about the Tuma Crafts Professional Wood Carving Chisel Set is that it comes with it’s own high quality carrying pouch. Not only that, but it says professional grade on it, but was made for beginners. All of the chisels in the set come pre-sharpened, so you can take them out and begin your wood working project right away. Each is made from high quality carbon steel and quality checked for assurance to know that the set is going to last for some time, and through an assortment of projects that you take on. 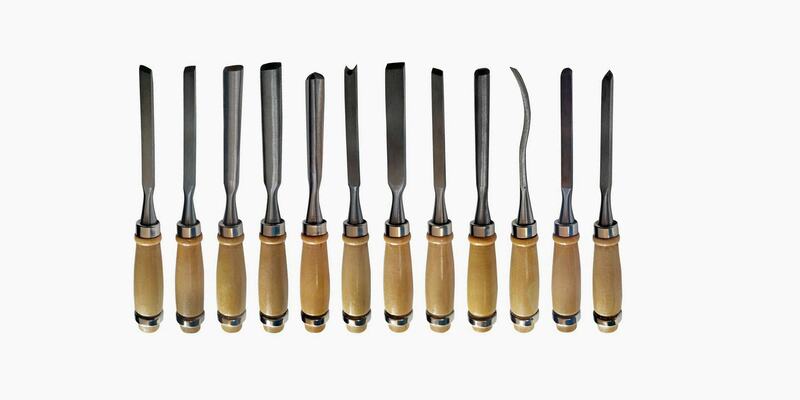 The set comes with 12 different pieces, and each of the chisels is a different size and shape, so that you’re able to create many different cuts using each one. This is definitely a set that is going to last for years if properly cared for, and loved by the beginner wood carver. 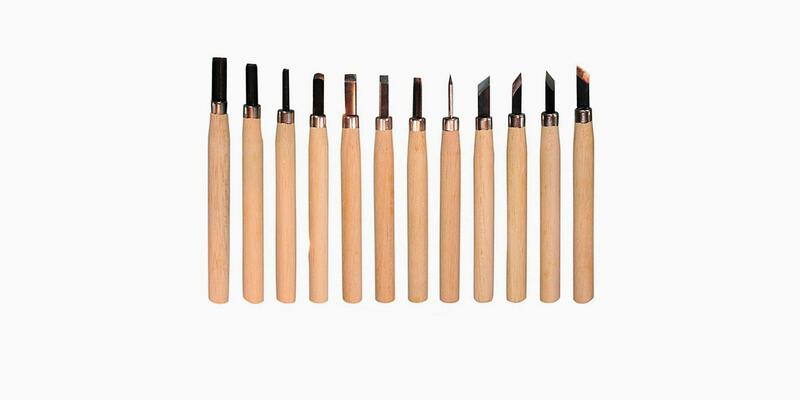 These tools are highly recommended for the beginner in wood working, and provide the comfort handles that can be used by hand or even with a mallet, depending on the project. The Ramelson Beginner’s Carving Tools also come with six different sizes, so you can choose which one works best with the project you’re working on. Though, a carrying case is not included, each one is neatly packaged when shipped and then can be added to the other tools that you currently own. The hardwood handles are ideal for holding onto, but will not split or splinter when used with a mallet. 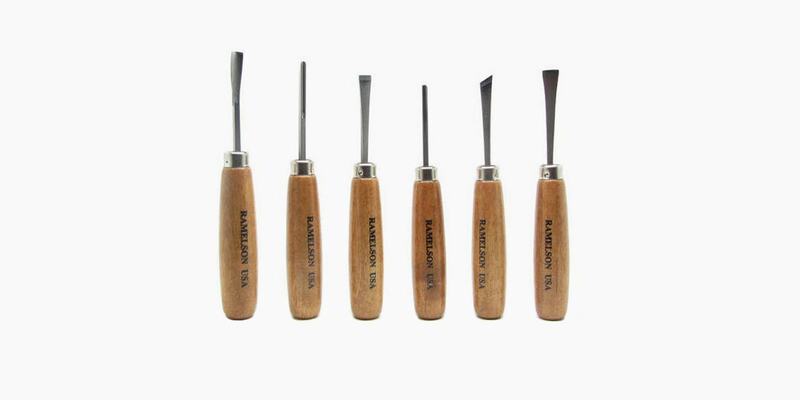 The chisels themselves, are made from a high quality carbon steel metal. Made in the USA, and quality checked to ensure that the beginner wood carver is able to carry out any number of projects with a high quality product. The last best thing, is that they are extremely affordable, allowing you to try out wood working without having to lose out on a lot of money. The biggest and best thing about the Two Cherries 11-Piece Carving Tools Set is that the set comes neatly packed inside a wooden box for storage. With 6 different chisels, four carving knives and even a sharpening stone, everything that is needed can be found tucked neatly away inside the box with a clasp closure. The entire set was hand forged from high quality carbon steel, by hand in Germany, making it an ideal gift set for the wood carver that you own, even the beginner. The octagon handles are a bit different from the other sets, but make them easier to grip, as well as keeping them in place when set on a bench or work station. They are heat treated, so that the tools are able to stay sharp for longer than other tools on the market. Light, balanced and strong and affordable when looking for a high quality beginner’s set for any wood worker that you know.